Amid controversy, the cellular form of the prion protein PrPc has been proposed to mediate oligomeric amyloid-β (Aβ)-induced deficits. In contrast, there is consistent evidence that the Src kinase Fyn is activated by Aβ oligomers and leads to synaptic and cognitive impairment in transgenic animals. However, the molecular mechanism by which soluble Aβ activates Fyn remains unknown. Combining the use of human and transgenic mouse brain tissue as well as primary cortical neurons, we demonstrate that soluble Aβ binds to PrPc at neuronal dendritic spines in vivo and in vitro where it forms a complex with Fyn, resulting in the activation of the kinase. Using the antibody 6D11 to prevent oligomeric Aβ from binding to PrPc, we abolished Fyn activation and Fyn-dependent tau hyperphosphorylation induced by endogenous oligomeric Aβ in vitro. Finally, we showed that gene dosage of Prnp regulates Aβ-induced Fyn/tau alterations. Together, our findings identify a complete signaling cascade linking one specific endogenous Aβ oligomer, Fyn alteration, and tau hyperphosphorylation in cellular and animal models modeling aspects of the molecular pathogenesis of Alzheimer's disease. According to our current knowledge, Alzheimer's disease (AD) may result from abnormal changes in soluble amyloid-β (Aβ) and tau proteins before the formation of amyloid plaques and neurofibrillary tangles in the cerebral parenchyma. With evidence indicating that soluble forms of Aβ, also called Aβ oligomers, may be the real culprits for AD (Walsh et al., 2002; Lesné et al., 2006; Shankar et al., 2008), there has been a paradigm shift in the approach to studying disease-associated proteins. Following these reports, synthetic oligomeric forms of Aβ have been proposed to inhibit long-term potentiation (LTP) upon binding to the cellular form of the prion protein, PrPc (Laurén et al., 2009). Several groups, however, failed to reach the conclusions that Aβ-induced LTP inhibition/cognitive impairment is dependent on PrPc (Balducci et al., 2010; Calella et al., 2010; Kessels et al., 2010), fueling an intense debate regarding the role of PrPc in AD (Benilova and De Strooper, 2010). More recently, antibodies targeting the 94–104 domain of PrPc blocked the inhibition of LTP triggered by soluble extracts of AD brain (Barry et al., 2011; Freir et al., 2011). In the latter study, both synthetic Aβ oligomers, or Aβ-derived diffusible ligands (ADDLs), and soluble extracts of AD brain were unsuccessful at blocking LTP in PrP-null hippocampal slices (Freir et al., 2011). In addition, insoluble monomeric Aβ was also proposed to bind to PrPc (Zou et al., 2011). Thus, PrPc appears to be required to mediate plasticity impairments triggered by certain Aβ species, which remain to be identified. In contrast, there is evidence documenting the implication of the Src tyrosine kinase Fyn in Aβ-induced neuronal dysfunction: (1) genetic ablation of Fyn protects oligomeric Aβ-mediated toxicity (Lambert et al., 1998), (2) alterations of Fyn expression and activation induced by Aβ plays a role in synaptic and cognitive impairment in AD mouse models (Chin et al., 2004, 2005; Roberson et al., 2011), and (3) Fyn can mediate Aβ/tau-induced toxicity (Williamson et al., 2002, 2008; Haass and Mandelkow, 2010; Ittner et al., 2010). Despite these studies linking Aβ and Fyn, the molecular mechanism by which endogenous soluble extracellular Aβ species activate the intracellular Fyn kinase remains unknown. A recent study demonstrated that synthetic Aβ oligomers bind to postsynaptic PrPc resulting in Fyn activation and neuronal demise (Um et al., 2012). However, while the authors described that their interaction relate to a “subset of Aβ peptide” and that different Aβ oligomeric species might elicit different mechanisms, the type of endogenous Aβ molecule interacting with PrPc:Fyn is still an enigma. Resolving this mystery is particularly important if one hopes to use this biological event as a possible diagnostic and therapeutic tool. In this study, we report that affinity-purified human Aβ oligomers form a complex with PrPc and Fyn ex vivo, in situ, and in vitro, leading to the abnormal phosphorylation of Fyn and tau in a PrPc-dependent manner. Finally, Prnp gene dosage differentially regulates Aβ-induced Fyn and tau phosphorylation in vivo. Brain tissue from the inferior temporal gyrus (Brodman area 20) from 85 subjects enrolled in the Religious Order Study underwent biochemical analyses. One brain specimen showed signs of protein degradation and was discarded from all analyses, resulting in a total number of 84 brain tissue samples used in this study. The demographic and clinical characteristics of the cases selected for these analyses were representative of all Religious Order Study cases available at the time. Each participant had undergone uniform structured baseline clinical evaluation and annual follow-up evaluation until death (Bennett et al., 2012). Briefly, dementia and AD diagnosis required evidence of meaningful decline in cognitive function and impairment on at least two cognitive domains (for AD, one domain had to have been episodic memory), based on the results of 21 cognitive performance tests and their review by a clinical neuropsychologist and expert clinician. “Mild cognitive impairment” (“MCI”) refers to participants with cognitive impairment as assessed by the neuropsychologist but without a diagnosis of dementia, as determined by the clinician. “No cognitive impairment” (“NCI ”) refers to those individuals without dementia or MCI. At death, a neurologist, blinded to all postmortem data, reviewed all available clinical data and rendered a summary diagnostic opinion regarding the clinical diagnosis at the time of death (Bennett et al., 2002, 2006). Following death, each case was assigned a Braak score based on neuronal neurofibrillary tangle pathology (Braak and Braak, 1991), a neuritic plaque score based on the modified Consortium to Establish a Registry for Alzheimer Disease (CERAD) criteria (excluding age and clinical diagnosis), and an AD pathologic diagnosis based on the National Institute on Aging–Reagan criteria by examiners blinded to all clinical data (Bennett et al., 2005; Schneider et al., 2009). Neuritic plaques, diffuse plaques, and neurofibrillary tangles in the inferior temporal cortex were counted after Bielschowsky silver staining, as previously described (Bennett et al., 2003). The characteristics of the three clinical diagnostic groups are summarized in Table 1. Mice from the APP line Tg2576, which express the human amyloid precursor protein with the Swedish mutation (APPKM670/671NL), directed by the hamster PrP promoter (Hsiao et al., 1996), were purchased from Taconic Farms and bred to obtain wild-type and hemizygous transgenic littermates. APPPS1 mice (Radde et al., 2006) (kindly provided by Dr. Mathias Jucker, University of Tübingen, Tübingen, Germany), coexpressing the same mutant APP and mutant presenilin-1 (PS1L166P) were crossed with mice lacking (Prnp−/−) or overexpressing PrPc under the mouse PrP promoter (tga20) as described previously (Calella et al., 2010). Both male and female mice were used in all experiments. Mouse cortical cultures of neurons were prepared from 14- to 15-d-old embryos as described previously (Lesné et al., 2005) using 5 × 105 cells/dish. After 3 d in vitro (DIV), neurons were treated with 10 μm AraC to inhibit proliferation of non-neuronal cells. All experiments were performed on near-pure neuronal cultures (>98% of microtubule-associated protein 2-immunoreactive cells) after 12–14 DIV. Three to six 35 mm dishes per culture per condition were used across three independent experiments. Following treatment(s), cells were harvested in an ice-cold lysis solution containing 50 mm Tris-HCl, pH 7.4, 150 mm NaCl, 0.1% Triton X-100 (Sigma-Aldrich) with 1 mm phenylmethylsulfonyl fluoride (PMSF), 2 mm 1,10-phenanthroline monohydrate (1,10-PTH), 1% (v/v) mammalian protease inhibitor mixture (Sigma-Aldrich), and 0.1% (v/v) phosphatase inhibitor cocktails A (Santa Cruz Biotechnology) and 2 (Sigma-Aldrich). Cell lysates were centrifuged for 10 min at 13,000 × g, supernatants were isolated, and corresponding pellets were resuspended with the protease/phosphatase inhibitor-containing lysis buffer to extract membrane-bound proteins. Plasma membranes were solubilized in RIPA lysis buffer [50 mm Tris-HCl, pH 7.4, 150 mm NaCl, 0.5% Triton X-100, 1 mm EGTA, 3% SDS, 1% deoxycholate, 1 mm PMSF, 2 mm 1,10-PTH, 1% (v/v) mammalian protease inhibitor mixture (Sigma-Aldrich), 0.1% (v/v) phosphatase inhibitor cocktails A (Santa Cruz Biotechnology) and 2 (Sigma-Aldrich)]. Membrane lysates were then subjected to centrifugation for 10 min at 16,000 × g, and the soluble fraction was removed and stored for analysis. For analyzing Aβ species, we used two extractions protocols described previously (Lesné et al., 2006; Shankar et al., 2008; Sherman and Lesné, 2011). In particular, membrane-enriched protein extracts (or MB extracts) refer to protein lysates obtained following the third step of a serial extraction with a lysis RIPA buffer composed of 50 mm Tris-HCl, pH 7.4, 150 mm NaCl, 0.5% Triton X-100, 1 mm EDTA, 3% SDS, and 1% deoxycholate. As detailed in methodology chapter recently published (Sherman and Lesné, 2011), samples are then centrifugated at 16,100 × g for 90 min. Supernatants are collected and pellets further extracted with formic acid to analyze fibrillar/deposited proteins. It is possible that the use of the RIPA lysis buffer might strip loosely bound Aβ from plaques. Protein amounts were determined by the Bradford protein assay (BCA Protein Assay; Pierce). All supernatants were ultracentrifuged for 60 min at 100,000 × g. Finally, before analysis, fractions were endogenous immunoglobulins were depleted by sequentially incubating extracts for 1 h at room temperature with 50 μl of protein A-Sepharose, Fast Flow followed by 50 μl of protein G-Sepharose, Fast Flow (GE Healthcare Life Sciences). One milligram of total proteins from AD brain TBS extracts (Shankar et al., 2008) were incubated for 3 h at 4°C with protein G-coupled magnetic beads (MagG beads; GE Healthcare Life Sciences) previously cross-linked with 200 μg of purified 6E10 antibody (Covance) or with 200 μg of Mab13.1.1 and Mab2.1.3 (100 μg of each). Immunocaptured proteins were eluted from the immune complexes using 1% OTG (n-octyl-β-d-thioglucopyranoside) (Sigma-Aldrich) in 100 mm glycine, pH 2.8, for 1 min (three rounds). Relative amounts of purified oligomeric Aβ were calculated based on synthetic Aβ1–42 standards (0.001, 0.025, 0.05, 0.1, 0.25, 0.5, 1, and 2.5 ng) that were run alongside the samples used for experiments. Immunoaffinity-purified protein extracts were loaded on Tricorn Superdex 75 columns (GE Healthcare Life Sciences) and run at a flow rate of ∼0.3 ml/min. Fractions of 250 μl of eluate in 50 mm Tris-HCl, 150 mm NaCl, 0.01% Triton X-100, pH 7.4, were collected using a BioLogic DuoFlow QuadTec 40 system (Bio-Rad) coupled to a microplate-format fraction collector. A280 was determined live during the experiments and confirmed following each run on a DTX800 Multimode microplate reader (Beckman Coulter). Electrophoreses were done on precast 10–20% SDS-polyacrylamide Tris-Tricine gels, 10.5–14 and 4–10.5% Tris-HCl gels (Bio-Rad). Protein levels were normalized to 2–100 μg of protein per sample (depending on targeted protein) and resuspended with 4× Tricine loading buffer. Thereafter, proteins were transferred to 0.2 μm nitrocellulose membrane (Bio-Rad). Nitrocellulose membranes were boiled in 50 ml of PBS by microwaving for 25 and 15 s with 3 min intervals. Membranes were blocked in Tris-buffered saline–0.1% Tween 20 (TTBS) containing 5% bovine serum albumin (BSA) (Sigma-Aldrich) for 1–2 h at room temperature, and probed with appropriate antisera/antibodies diluted in 5% BSA–TTBS. Primary antibodies were probed either with anti-IgG immunoglobulins conjugated with biotin or InfraRed dyes (LI-COR Biosciences). When biotin-conjugated secondary antibodies were used, IR-conjugated NeutrAvidin (Pierce) was added to amplify the signal. Blots were revealed on an Odyssey platform (LI-COR Biosciences). When required, membranes were stripped using Restore Plus Stripping buffer (Pierce) for 30–180 min at room temperature depending on antibody affinity. Densitometry analyses were performed using OptiQuant software (Packard Bioscience) or using the Odyssey software (LI-COR). Each protein of interest was probed in three individual experiments under the same conditions, and quantified by software analysis, following determination of experimental conditions ascertaining linearity in the detection of the signal, and expressed as density light units (DLUs). The method used allows for a dynamic range of ∼100-fold above background (0.01 × 106 DLU). Respective averages were then determined across the triplicate Western blots. Normalization was performed against the neuron-specific nuclear protein NeuN, also performed in triplicate. None of the protein brain levels measured correlated with postmortem interval, arguing against potential protein degradation within human tissues (data not shown). Aliquots (100 μg) of protein extracts were diluted to 1 ml with dilution buffer (50 mm Tris-HCl, pH 7.4, 150 mm NaCl) and incubated with appropriate antibodies (10 μg of either C20 or 8B4; 5 μg of 6E10 or Mab2.1.3/13.1.1 antibodies) overnight at 4°C, and added 50 μl of protein G-Sepharose, Fast Flow (GE Healthcare Life Sciences) 1:1 (v/v) slurry solution with dilution buffer (50 mm Tris-HCl, pH 7.4, 150 mm NaCl, pH 7.4) for 2 h. The beads were washed twice in 1 ml of dilution buffer, and proteins were eluted in 25 μl of loading SDS-PAGE buffer by boiling. The following primary antibodies were used in this study: 6E10 (1:2500), 4G8 (1:2500), biotinylated-6E10 (1:2500), Tau5 (1:2000), 6D11 (10 μg) (Covance), DW6 antiserum (1:1000) (kind gift from Dr. Dominic Walsh, Harvard University, Boston, MA), anti-α-tubulin (1:100,000) (Sigma-Aldrich), anti-PrP(C-20) (1:200), anti-PrP(8B4) (1:1000), anti-Fyn(Fyn3) (1:200), anti-PSD95 (1:200) (Santa Cruz Biotechnology), anti-Fyn (1:1000) (BD Biosciences), anti-pSrc (Y416) (1,1000) (Cell Signaling), anti-pY18 (1:2500) (kind gift from Gloria Lee, University of Iowa, Iowa CIty, IA), 40/42-end specific Mab2.1.3 and Mab13.1.1 (1:1000) (kind gift from Pritam Das, Mayo Clinic, Jacksonville, FL), anti-NeuN (1:5000) (Millipore Bioscience Research Reagents), and anti-MAP2 (1:500) (Novus Biologicals). Triple- or quadruple-label immunofluorescence was performed as previously described (Lesné et al., 2005) using Alexa Fluor 488, 555, 635-conjugated secondary antibodies (Invitrogen). Human brain sections were treated for autofluorescence with 1% Sudan Black solution (Schnell et al., 1999) and coverslipped with ProLong-DAPI mounting medium (Invitrogen). Digital images were obtained using an Olympus IX81 FluoView1000 microscope with laser intensities ranging from 7 to 11%. Raw image z-stacks (0.2 μm intervals) were analyzed using Bitplane's Imaris7.x software suite. Frame size was maintained at 1024 × 800 and optical zoom of 1.00 was used to allow for maximum distribution of pixel size to tissue dimensions without over sampling. Six regions of interest (ROIs) per brain section (six sections/case) per case (three cases per group) were used for voxel quantification. Z stacks were reconstructed using the Surpass module of the Imaris software package (version 7.x; Bitplane). Dendritic shafts and spines were manually traced in the xy plane using the AutoDepth function of the Filament module. After tracing, accurate reconstruction of the diameter of the dendritic shaft and spines was made possible using the diameter function with a constant contrast threshold. Since many variables were non-normally distributed, nonparametric statistics were used (Spearman's ρ correlation coefficients, Kruskal–Wallis nonparametric ANOVA followed by Bonferroni-corrected two-group post hoc Mann–Whitney U tests). Analyses were performed using StatView software, version 5.0.1, and JMP 8.0.1 (SAS Institute). Using an extremely well characterized cohort from the Religious Order Study (Table 1), we first sought to measure the protein expression of PrPc, Fyn, and phosphorylated Fyn (pY416-Fyn) in human brain tissues by Western blot/immunoprecipitation (Fig. 1A). To take into consideration neuronal cell loss across clinical groups, we also determined tissue levels of the neuron-specific nuclear protein NeuN (data not shown), and protein expressions of PrPc, Fyn, and pFyn were normalized to NeuN values (Fig. 1B--D). Our results indicate an elevation of membrane-bound PrPc in AD brain tissue compared with MCI and NCI (Fig. 1B). Total Fyn levels (Fig. 1C) were unchanged across clinical groups, whereas pY416-Fyn brain levels rose in AD compared with NCI (2.15-fold) and MCI (1.38-fold) (Fig. 1D). When testing whether these modulations of protein expression were associated with each other, we found that PrPc and Fyn were highly correlated (Fig. 1E) in human brains regardless of clinical status (data not shown). The observed relationship was not caused by the normalization to NeuN as regression analyses using absolute data still indicated a positive correlation between PrPc and Fyn levels (Spearman's ρ = 0.383; p = 0.0004). Interestingly, pY416-Fyn and PrPc protein expressions correlated positively in the AD group (Fig. 1F) but not in NCI or MCI groups, even though a weak trend for a possible positive correlation between PrPc levels and pFyn levels in MCI subjects was noticed (Spearman's ρ = 0.144; p = 0.0769) (data not shown). Of note, the accumulation of PrPc in AD was not linked to astroglial activation as indicated by the absence of correlation between GFAP and PrPc levels (r = 0.056; p, not significant) (data not shown). Increased membrane-bound PrPc levels are associated with Fyn activation in AD. A, Representative Western blot (WB) for PrPc, Fyn, pY416-Fyn, and NeuN in 10 of 84 specimens of NCI (N), MCI (M), and AD (A) composing our cohort. PrPc, Fyn, and α-tubulin were measured by direct WB, while pY416-Fyn levels were estimated following total Fyn immunoprecipitation. B–D, Box plots for PrPc (B), Fyn (C), and pY416-Fyn (D) protein levels in the MB fraction of NCI, MCI, and AD groups. Total Fyn levels were unchanged, whereas the levels of its active phosphorylated form, pY416-Fyn, were increased in the AD group compared with NCI and MCI [Kruskal–Wallis followed by Mann–Whitney's U test and Bonferroni's correction (p < 0.05)]. E, F, Linear regression analyses between PrPc/Fyn (E) and PrPc/pY416-Fyn (F) protein levels (Spearman's rank correlation). PrPc and total Fyn showed a strong association regardless of clinical status (E). In contrast, a significant positive correlation was only found in the AD group linking activated Fyn and PrPc levels. In the figure legends, the italicized numbers between parentheses indicate group sizes. NCI is shown in green, MCI in yellow/orange, and AD in red. In box plots, the bar inside the box indicates the median; the upper and lower limits of boxes represent the 75th and 25th percentiles, respectively; and the bars flanking the box represent 95th and 5th percentiles. *p < 0.05; **p < 0.01. EC, extracellular-enriched fraction; IC, intracellular-enriched fraction; MB, membrane-associated fraction; Tg, transgenic; DLU, densitometry light unit; A.U., arbitrary unit. To examine whether PrPc interacts with Fyn in AD brain tissue, we performed coimmunoprecipitations using membrane-enriched protein extracts (Sherman and Lesné, 2011; Larson et al., 2012). Following pulldown of PrPc with either 8B4 (N terminus PrP antibody) or C20 (C terminus PrP antibody), we observed that using C20 yielded better capture efficiencies. Despite this difference, Fyn and caveolin-1 coimmunoprecipitated with PrPc, indicating the presence of a PrPc/Fyn/Caveolin-1 complex in AD brain protein extracts (Fig. 2A). Our results suggest that the observation reported in cell lines by Mouillet-Richard et al. (2000) may also be true using human brain tissue. We then tested whether PrPc could form a putative complex with Fyn and endogenous soluble Aβ species in brains of subjects with AD or without cognitive impairment (Fig. 2B). Throughout this report, the term “soluble Aβ” refers to Aβ molecules that remain soluble in aqueous buffers after tissue homogenization and ultracentrifugation (see Materials and Methods). Following PrPc immunoprecipitation, Fyn was detected readily in AD brain extracts but not in age-matched controls (top inset, left panel). To identify potential Aβ species, nitrocellulose membranes were stripped and probed with 6E10. Under these conditions, Aβ dimers were the only oligomeric Aβ assembly detected. Neither Aβ*56 nor large Aβ protofibrils (∼150 kDa) were found coimmunoprecipitating with PrPc using brain lysates from subjects with AD (data not shown). These results were reproduced across a selection of six cases per group (five additional cases are shown) and, importantly, without stripping the membranes (Fig. 2B, right panel). To confirm the specificity of our observations, we incubated human brain extracts containing PrPc but with no detectable Aβ as assessed by Western blot (Fig. 2C, lane 1) with affinity-purified Aβ oligomers (2.85 ng) from TBS fractions of human AD brains (Fig. 2C, lane 2, and D, lane 1, for left and right panels). PrPc was then immunoprecipitated, and potential Aβ binding was determined with either 40/42-end specific Aβ antibodies or 6E10. In both cases, dimeric Aβ was the only assembly found to interact with PrPc despite the clear presence of Aβ monomers, trimers, and larger assemblies (including Aβ*56 and ∼150 kDa protofibrils) in the exogenous mixture (Fig. 2D). Our results suggested that endogenously produced Aβ dimers are specifically binding to PrPc/Fyn in lysed AD brain extracts. While forms composed of SDS-stable Aβ dimers appear to interact with PrPc/Fyn, it is conceivable that higher molecular weight assemblies of Aβ existing in the absence of denaturing agents may also interact with this pathway. PrPc immunoprecipitates specifically with human soluble Aβ dimers. A, Potential interaction of PrPc with Fyn in AD brain tissues was assessed by SDS-PAGE analysis of the PrPc/caveolin-1/Fyn complex following immunoprecipitation of PrPc (with 8B4 or C20 antibodies) or Fyn. The gray arrowheads indicate exogenous antibodies used for IP. B, PrPc forms a putative complex with Fyn and soluble Aβ dimers using AD brain tissue. Western blots for Aβ were performed with 6E10. Following membrane stripping, PrPc and Fyn were revealed with PrP C20 and Fyn3 antibodies. Additional IPs with different cases are shown on the right panels to illustrate the reproducibility of the findings. C, Western blot analysis of TBS-soluble extracts from selected brains of subjects with AD or no cognitive impairment (N). Monomers, dimers, and trimers are readily detected using 6E10. D, Immunoprecipitation of PrPc with exogenous human Aβ dimers in a cell-free assay. Affinity-purified human soluble Aβx-40/42 species (lane 1, left and right panels, an estimated total of 2.85 ng relative to Aβ1–42 standards) were added to brain protein extracts with no detectable Aβ (N; same as A); PrPc was immunoprecipitated using the C20 antibody and bound Aβ species were detected with 40/42-end specific antibodies (top left panel) or 6E10 (bottom left and right panels). Full Western blot images indicated that isolated large soluble Aβ assemblies (e.g., Aβ*56 and protofibrils) were not pulled down by C20 in our assay (right panel). IP, immunoprecipiration; No Ab, no antibody; N, nonimpaired age-matched control brain; AD, Alzheimer's disease brain; oAβ, endogenous oligomeric Aβ species purified from human AD brain tissue; sAβ1–42, 0.5 ng of human synthetic Aβ1–42 (Sigma-Aldrich). To test whether this potential association occurs in situ, we analyzed PrPc and Aβ cellular distribution in AD brains by confocal immunofluorescence imaging (Fig. 3). While PrPc was largely predominant in the ER in non-neuronal cells, PrPc was also present at apparent specific synaptic sites and colocalized with Aβ (Fig. 3A,B), consistent with the notion that Aβ is a ligand for PrPc. At those areas (Fig. 3Ab–Ae,B), the respective fluorescence for PrPc and for Aβ was overlapping, possibly indicating that Aβ binding to PrPc at the neuronal surface occurs in vivo. In contrast, we did not observe any apparent dendritic puncta with PrPc and Aβ colocalizing in age-matched control brain sections (Fig. 3Ag,Ah). We went on similarly to determine whether Fyn was also colocalized with PrPc and Aβ by performing a quadruple-channel image analysis (Fig. 3B). Fyn (in magenta) was preferentially observed at spines along the dendritic shaft (in blue), some of which were also positive for PrPc and Aβ. Software-based voxel analyses revealed that, while ∼35% of Aβ colocalized with the postsynaptic protein Fyn at dendritic spines, <10% of Aβ (8.86 ± 1.27) colocalized with PrPc (Fig. 3C). These numbers are compatible with the data from the study by Laurén et al. (2009) indicating that only a fraction of synthetic Aβ oligomers binds to PrPc and with the knowledge that soluble Aβ molecules bind to synapses. Together, the colocalization of Aβ-PrPc-Fyn further supports our hypothesis that synaptic PrPc might act as a potential receptor for endogenous soluble Aβ species in AD. PrPc and soluble Aβ colocalize at dendritic spines in human AD brain tissues. Surface rendering of triple-channel confocal immunofluorescence reveals that PrPc (in red, labeled using the C20 antibody) and Aβ (green, labeled using the DW6 antiserum) colocalize with the postsynaptic protein Fyn (magenta) along neuronal dendritic shafts (in blue, labeled using a MAP-2 antibody) in human brain tissues [AD (a–f); age-matched NCI (g, h)]. Images were acquired using oil-immersion 60 or 100× objectives and processed with Imaris7.0 software. Transparency of the 405, 488, 536 nm channels (magenta, green, red) was increased to 40% to visualize the rendered volumes of all other fluorescent probes conjointly. A, Low- and high-power images of PrPc/Aβ puncta along dendritic shafts of inferior temporal gyrus neurons. Examples of colocalization between PrPc and Aβ at higher magnification are shown in b–f. Please note the lack of colocalization of PrPc and Aβ on dendrites of NCI brain sections (g, h). Scale bars: a, g, 10 μm; b–e, 3 μm; f, 4 μm; h, 5 μm. B, PrPc:Aβ complexes colocalize with the dendritic spine protein Fyn in vivo. Scale bar, 1 μm. C, Software-assisted quantification of colocalized voxels (N = 3 subjects/6 sections/18 ROIs). Bars represent the mean ± SD. To confirm these results, we opted to test whether Aβ could activate Fyn in primary cortical neurons from the widely used AD mouse model Tg2576 (Hsiao et al., 1996). The soluble Aβ species produced and secreted by Tg2576 neurons have been previously described (Lesné et al., 2006). To illustrate the oligomeric Aβ content in conditioned medium of primary cortical Tg2576 neurons, Aβ molecules were analyzed by Western blot/immunoprecipitation (Fig. 4A). Apparent SDS-resistant Aβ tetramers (18 kDa), trimers (13–14 kDa), dimers (8–9 kDa), and monomers (4 kDa) were readily detected, with trimeric Aβ seemingly the most abundant oligomeric Aβ species as detected with 6E10. This observed profile is similar to the one previously reported (Lesné et al., 2006) at the exception of dimers, which were then not detected likely due to the increased sensitivity in our current system (lower detection limit of ∼2 pg). We first confirmed the presence of soluble Aβ and PrPc at postsynaptic sites identified with the labeling of the postsynaptic density protein 95 (PSD95) (Fig. 5A). Quantification of dendritric sections (six ROIs per culture dish per experiment) indicated that 46.83 and 36.69% of Aβ colocalized with PSD95 and PrPc, respectively, in Tg2576 neurons (Fig. 5B). If PrPc activates Fyn upon binding of soluble Aβ, we postulated that Aβ, PrPc, and pFyn should be localized at the same postsynaptic spines. Figure 5C shows that using antibodies specific to Aβx-42, pY416-Src and PrPc, soluble Aβ42/pSrc/PrPc are actually sequestered at the same subcellular space in 14-d-old cortical Tg2576 neurons. Interestingly, those sites also included enlarged varicosities (Fig. 5C, arrowheads), seen when the tubulin/tau axis is abnormally disrupted by low-molecular-weight Aβ oligomers (Jin et al., 2011). Biochemical characterization of soluble Aβ species present in Tg2576 conditioned medium and in human brain tissues. Western blot analyses of affinity-purified soluble Aβ species present in conditioned media (CM) of Tg2576 primary cortical neurons and in soluble TBS extracts human AD brain. A, Immunoprecipitation of soluble APP/Aβ molecules present in CM of Tg2576 primary neurons (DIV12–14) using 6E10. A high-intensity laser scan is also shown to better visualize Aβ monomers, dimers, and trimers (bottom inset). B, Representative profile of soluble Aβ oligomers affinity-purified with 40- and 42-end specific antibodies (Mab 2.1.3 and Mab13.1.1; kindly provided by Dr. Pritam Das) to prevent capturing APP molecules and detected with 6E10 (left panel) or 4G8 (right panel). Several soluble Aβ assemblies are readily observed: monomers, dimers, trimers, Aβ*56, a larger 60 kDa oligomer, and protofibrils >150 kDa. C, Typical size exclusion chromatogram of the endogenous human Aβ oligomers shown in B using a Tricorn Superdex 75 column. Five peaks (green arrows) corresponding to the five Aβ species seen by Western blot are clearly observed with elutions at predicted molecular weights (blue arrows correspond to the six molecular weight standards used). D, Representative Western blot images of the respective size exclusion chromatography fractions isolated in C using 6E10. Specific PrPc antibodies prevent soluble Aβ-induced Fyn activation in primary neurons. A, Quadruple-channel confocal immunofluorescence reveals that PrPc (labeled using the C20 antibody) and Aβ (labeled using the DW6 antiserum, a kind gift from Dr. Dominic Walsh) colocalize on neuronal dendritic spines (labeled using a PSD95 antibody) in 14-d-old primary cortical Tg2576 neurons. B, Quantification of colocalized voxels for each channel pair of interest. Representative 3D-rendered images used for voxel counts are shown in the left panel. Results for channel pairs are shown in the histogram. C, Triple-channel confocal imaging shows that Aβ42 species partly colocalize with pY416-Src and PrPc in Tg2576 primary neurons. D, Exogenous Aβ species purified from AD brain tissue colocalized with PrPc and Fyn at dendritic spines after application onto nontransgenic primary cortical neurons. E, F, Fyn activation induced by human oligomeric Aβ is partially blocked by the antibody 6D11 targeting the 95–105 domain of PrPc. Preincubation with the N terminus PrPc antibody 8B4 failed to inhibit Fyn phosphorylation. 6D11 (10 μg) and 8B4 (10 μg) were preincubated for 2 h onto cells before acute oAβ exposure (1 h at 37°C). 6D11 reduced Fyn activation in wild-type neurons acutely exposed to human-brain purified Aβ oligomers (E) and in Tg2576 neurons chronically exposed to low-n Aβ oligomers (F). Images were acquired using an oil-immersion 60 or 100× objective and processed with Imaris7.1 software. The arrowheads indicate examples of colocalization between Aβ/PrPc, while white asterisks correspond to colocalization between Aβ and PSD95 in absence of PrPc. Bars represent the mean ± SD (n > 3–6 dishes/experiment; independent experiments were performed in triplicate). *p < 0.05, ANOVA followed by Student's t test. Since the oligomeric Aβ molecules secreted by Tg2576 neurons may differ from human brain-derived Aβ oligomers, we cultured primary cortical neurons from nontransgenic animals under the same conditions used for Tg2576 neurons and exposed them briefly (1 h) to nanomolar concentrations (5–6 nm) of affinity-purified oligomeric Aβ species from TBS AD brains extracts (Fig. 4B). These purified assemblies were characterized using multiple Aβ antibodies (6E10, 4G8, and 40/42-end specific Mab2.1.3 and Mab13.1.1) (kind gifts from Dr. Pritam Das) as well as by size exclusion chromatography (Fig. 4C). Recovered fractions were then reanalyzed by Western blotting to ensure that the absorbance peaks observed indeed contained the respective human Aβ oligomers (Fig. 4D). Both methods confirmed the presence of five predominant species including monomers, dimers, trimers, Aβ*56, and large (∼150 kDa) soluble protofibrils (PFs). Cells were then fixed and analyzed with confocal microscopy and biochemistry techniques. Using a 42-end specific antibody (Mab2.1.3) to avoid cross-reactivity with APP, we found that soluble Aβ species colocalized with PrPc/Fyn at synaptic spines (Fig. 5D), similarly to our previous observations in Tg2576 neurons. To demonstrate that Fyn activation induced by affinity-purified human oligomeric Aβ molecules (oAβ) depends on PrPc/Aβ interaction, we used the differential ability of two anti-PrPc antibodies to prevent Aβ binding to PrPc (Laurén et al., 2009). We therefore preincubated nontransgenic cortical neurons with either 6D11 (detecting the region 93–109 of PrPc) or 8B4 (N terminus PrPc antibody) for 2 h at 37°C, and then applied oAβ for 1 h at 37°C. Following this acute exposure with human brain-derived Aβ oligomers, Fyn was immunoprecipitated and pFyn levels were determined (Fig. 5E). Upon quantification, pY416-Fyn was elevated in neurons treated with human oAβ (a ∼300% increase compared with controls). Pretreatment with 6D11, an antibody preventing Aβ from binding to the 95–105 domain of PrPc, blocked Aβ-induced Fyn activation, whereas pretreatment with 8B4 had no effect. Importantly, either pretreatment did not modulate Fyn phosphorylation on its own (data not shown). Finally, we examined whether 6D11 could lower pY416-Fyn levels in a more chronic model of Aβ exposure using Tg2576 neurons (Fig. 5F). 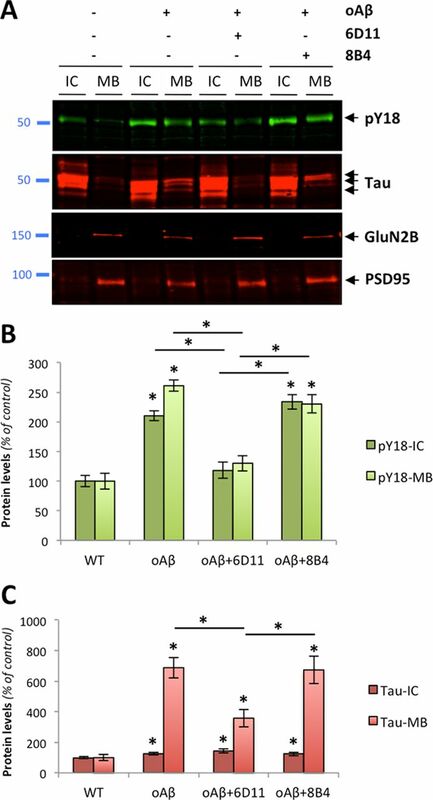 Similarly to the acute exposure paradigm, a 2 h application of 6D11 but not 8B4 was sufficient to reduce Aβ-induced phosphorylation of Fyn to ∼30% (28.58 ± 7.14) of control cells. Several reports suggested that Aβ, tau, and Fyn cooperate in AD-related pathogenesis (Lambert et al., 1998; Lee et al., 1998; Chin et al., 2004, 2005; Lee, 2005; Roberson et al., 2007). In follow-up studies, the genetic ablation of tau prevented cognitive decline induced by synergistic effects of Aβ and Fyn, indicating that Aβ, Fyn, and tau jointly impair synaptic function (Roberson et al., 2011). Since affinity-purified human oAβ species containing Aβ dimers induced Fyn activation in a PrPc-dependent manner, we examined possible changes in tau phosphorylation at Y18, a Fyn-specific site (Lee, 2005), in primary cortical neurons (Fig. 6). Because the dendritic role of tau regulates the postsynaptic targeting of Fyn conferring Aβ toxicity (Ittner et al., 2010) and because hyperphosphorylated tau abnormally accumulates in dendritic spines (Hoover et al., 2010), we also determined tau missorting to the postsynaptic density by determining its biochemical segregation in vitro. Two postsynaptic proteins, the glutamatergic NMDA receptor subunit 2B, GluN2B, and the scaffolding protein PSD95 were used as internal controls to ensure proper biochemical separation (Fig. 6A). In presence of oAβ (5 nm for 1 h), phosphorylation at Y18 sharply increased. In addition, tau compartmentalization was altered compared with controls (Fig. 6A,B). In addition to changes in its phosphorylation status, neuronal tau levels also showed a remarkable alteration of its cellular distribution (Fig. 6C), consistent with earlier observations (Ittner et al., 2010; Zempel et al., 2010). Both changes were dependent on oAβ–PrPc interaction as 6D11 pretreatment partially reduced pY18-tau and total tau levels in both cytosolic and PSD-containing protein fractions. As shown for Fyn activation, pretreatment with 8B4 did not reverse tau alterations induced by oligomeric Aβ. PrPc-dependent phosphorylation of tau induced by endogenous Aβ oligomers in primary neurons. A, Protein levels of hyperphosphorylated tau at Y18 (pY18-Tau) and total tau as assessed by Western blot using PY18 and Tau5 antibodies in wild-type primary neurons exposed to human-brain purified oligomeric Aβ (5 nm for 1 h). The glutamatergic NMDA receptor subunit 2B (GluN2B) and the scaffolding protein PSD95 were used as internal control. B, C, Quantitation of pY18-Tau (B) and total tau (C) across conditions and protein fractions (IC and MB) revealed a significant increase in tau hyperphosphorylation and mislocalization following oAβ exposure. This effect was partially inhibited by 6D11 but not 8B4 (bars represent the mean ± SD; *p < 0.05, ANOVA followed by Student's t test). To determine which oligomeric Aβ species isolated from AD brain tissue was responsible for altering the Fyn/tau axis, isolated Aβ species (monomers, dimers, trimers, Aβ*56, and PFs; Fig. 4C,D) were then applied to primary neurons for 1 h at equivalent concentration (5 nm) calculated based on synthetic Aβ1–42 standards (data not shown). 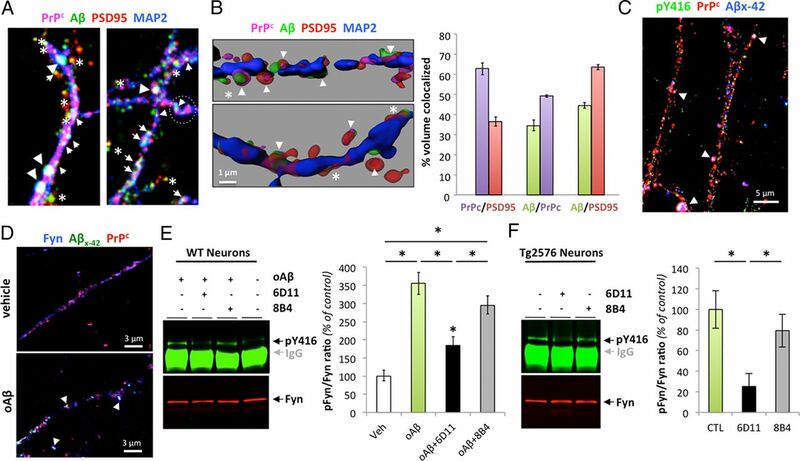 While monomeric Aβ, Aβ*56, and PF preparations did not appear to induce Fyn activation under these conditions, phosphorylated Fyn levels were markedly increased in neurons treated with either dimers or trimers (Fig. 7A,B). When we examined the phosphorylation status of two downstream targets of Fyn, pY18-Tau and pY1472-GluN2B, we observed increases in tau phosphorylation in dimer- and trimer-treated neurons but no change in total GluN2B levels in membrane extracts and in Y1472 status (Fig. 7B). Consistent with our coimmunoprecipitation results identifying Aβ dimers as an endogenous ligand to a PrPc:Fyn complex, these findings indicate that purified Aβ oligomers from AD brain tissue (identified as Aβ dimers under denaturing conditions) alter the Fyn/tau axis and suggest that the signaling pathway induced by Aβ trimers converges onto Fyn likely through a PrPc-independent mechanism. Human AD brain-purified Aβ dimers and trimers activate Fyn in primary cortical neurons. A, Application of purified soluble Aβ dimers and trimers selectively phosphorylate Fyn and tau as assessed by quantitative Western blotting (duplicates are shown; n = 4 per experiment). Sixty-minute-long treatments were performed at the calculated concentration of 5 nm for all species (estimated based on monomeric synthetic Aβ levels). Total protein levels of GluN2B and phosphorylation of GluN2B at Y1472 were also examined. Actin levels are shown as control. B, Quantification of the ratios for pY416-Src/Fyn (labeled as pFyn/Fyn), pY18-Tau/total tau (pTau/Tau), and pY1472-GluN2B/GluN2B (pGluN2B/GluN2B) after 1-h-long exposure with the human oligomeric Aβ species listed. Both brain-purified Aβ dimers and trimers activate Fyn in vitro. Isolated monomeric Aβ, Aβ*56, and soluble Aβ PFs did not induce Fyn phosphorylation under similar conditions. After 60 min, neither membrane-bound levels of GluN2B nor Y1472-GluN2B phosphorylation were altered by AD brain-derived Aβ species (bars represent the mean ± SD; *p < 0.05, ANOVA followed by Student's t test with Bonferroni's correction). To demonstrate that PrPc is mediating the deleterious effects induced by Aβ dimers, we used a genetic approach to examine the potential effects of Prnp gene dosage on Fyn/tau phosphorylation in vivo. Based on our previous findings, we hypothesized that Prnp gene ablation would attenuate oAβ-induced Fyn activation and tau hyperphosphorylation. In contrast, we anticipated that Prnp overexpression would potentiate Fyn and tau phosphorylation in APPPS1+ mice. We crossed APPPS1 transgenic mice (Radde et al., 2006) with PrPc-deficient mice (Prnp−/−) or with PrPc-overexpressing mice (tga20tg/−Prnp−/−, thereafter called tga20+). All lines used here were previously described (Büeler et al., 1992; Fischer et al., 1996; Calella et al., 2010). However, the respective levels of low-molecular-weight Aβ oligomers in these lines were not documented. Since these lines were previously used at 2–4 months of age (Calella et al., 2010), we first measured oligomeric Aβ levels in young and old mice (2 and 14 months of age, respectively) when amyloid deposition is either quite modest or very abundant (Radde et al., 2006). Figure 8A illustrates the respective levels of low-n Aβ oligomers across multiple animals per genotype. Importantly, we found no overall differences in Aβ levels resulting from the reduction of the Prnp copy number at each age studied (Calella et al., 2010) (data not shown). Aβ monomers and trimers were faintly present in 2-month-old APPPS1+×Prnp+/+, APPPS1+×Prnp+/−, APPPS1+×Prnp−/− mice (Fig. 8A, lanes 1–6). In contrast, Aβ dimers were readily visible in aged APPPS1+×Prnp+/− or APPPS1+×Prnp−/− as well as abundant monomers and trimers (Fig. 8A, lanes 7–12). Following the determination of the relative amounts of soluble Aβ oligomers in each animal, we examined the protein expression of Fyn and its activated phosphorylated form. Total Fyn levels were unchanged across genotypes at 2 and 14 months of age. As previously shown for other APP transgenic mouse models, pFyn levels were markedly increased in old APPPS1+×Prnp+/− mice. Phosphorylated Fyn levels were ∼10-fold lower in young APPPS1+ mice compared with aged APPPS1+×Prnp+/− animals (Fig. 7, lanes 1–6 vs 7–9). When both copies of Prnp were ablated in 14-month-old APPPS1+×Prnp−/−, pY416-Fyn levels dropped to 19.25 ± 8.01% compared with APPPS1 mice heterozygous for Prnp (Fig. 8B). Since the inhibition of Fyn phosphorylation was not restored to baseline levels (8–9% compared with 14-month-old APPPS1+×Prnp+/−), this result indicated that PrPc was required, in part, to mediate Fyn activation induced by the various oligomeric forms of Aβ present in aged APPPS1 mice. Prnp gene ablation attenuates Aβ-induced activation of Fyn and tau hyperphosphorylation in vivo. 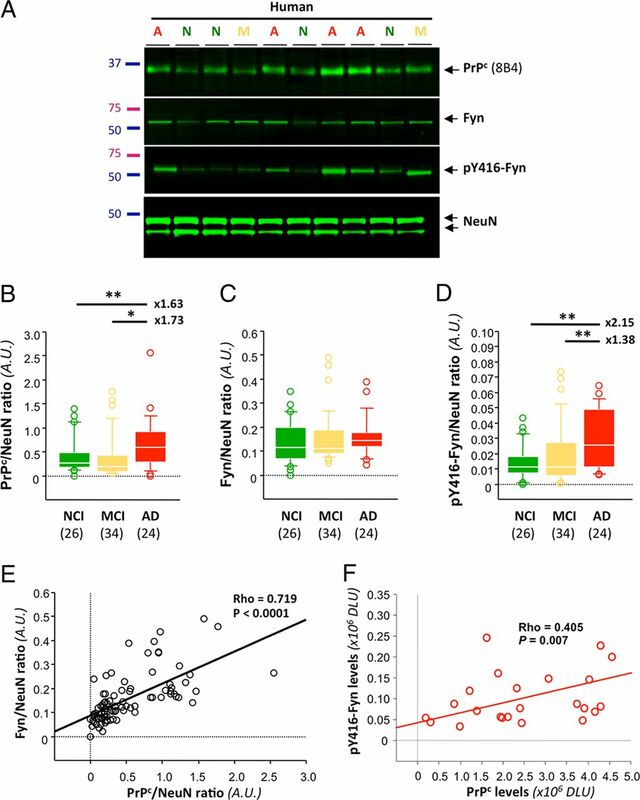 Gene ablation of Prnp modulates Fyn activation and tau phosphorylation at pY18 in brains of aged transgenic APPPS1+×Prnp animals. 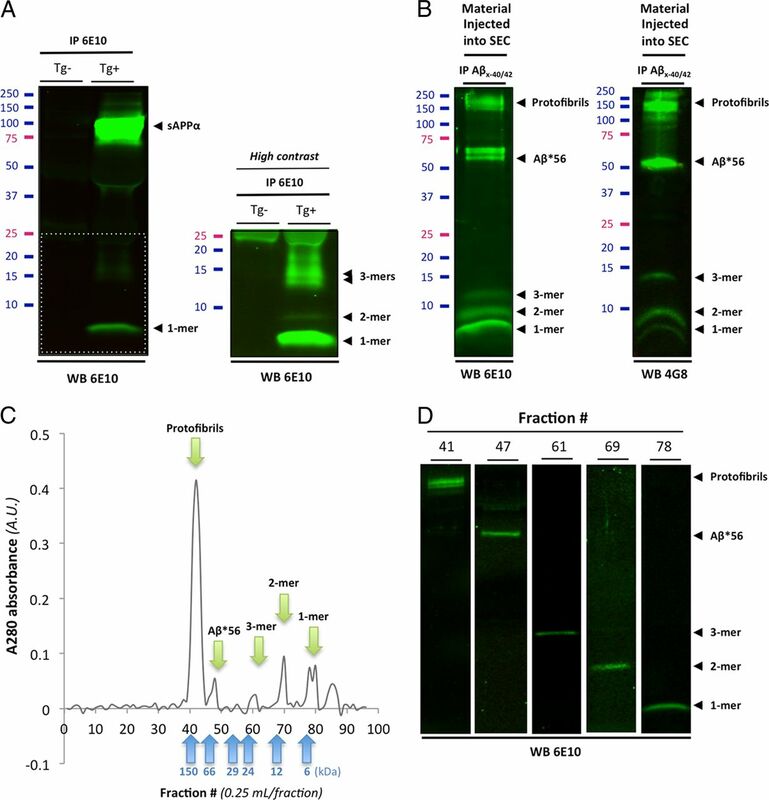 A, Protein levels of low-molecular-weight Aβ oligomers, total Fyn, and pY416-Src were assessed by quantitative Western blot (WB). 6E10 was used for Aβ. A marked reduction of pY416 was revealed in APPPS1+×Prnp−/− compared with APPPS1+×Prnp+/− mice. B, Relative protein levels for total Fyn and pY416-Fyn determined by densitometry analyses. C, D, Prnp gene deletion limits tau hyperphorphorylation and missorting in vivo. PY18-tau and total tau levels were measured by WB using either intracellular-enriched or membrane-enriched protein extracts (C) and quantified by software analysis (D). APPPS1+×Prnp−/− mice showed a more than twofold reduction in tau phosphorylation at Y18 compared with APPPS1+×Prnp+/− littermates (bars represent the mean ± SD; *p < 0.05, ANOVA followed by Student's t test; n ≥ 3 animals/genotype/age/experiment). To determine whether the reduction of Fyn activation observed in aged APPPS1+×Prnp−/− mice had any effect on tau phosphorylation and tau missorting, we assessed total tau and pY18-Tau levels in intracellular (IC)- and membrane (MB)-enriched fractions of aged APPPS1+×Prnp mice (Fig. 8C,D). Under physiological conditions (i.e., when the APPPS1 transgene is not expressed), soluble tau is nearly exclusively found in the IC fraction and tau is not phosphorylated at Y18 (Fig. 8C, lanes 1 and 2 of right and left panels). In the presence of soluble Aβ/hAPP (Fig. 8A), hyperphosphorylated tau abnormally accumulated within MB extracts (Fig. 8C, lanes 5 and 6) similarly to our in vitro findings (Fig. 7). When both copies of Prnp were ablated (Fig. 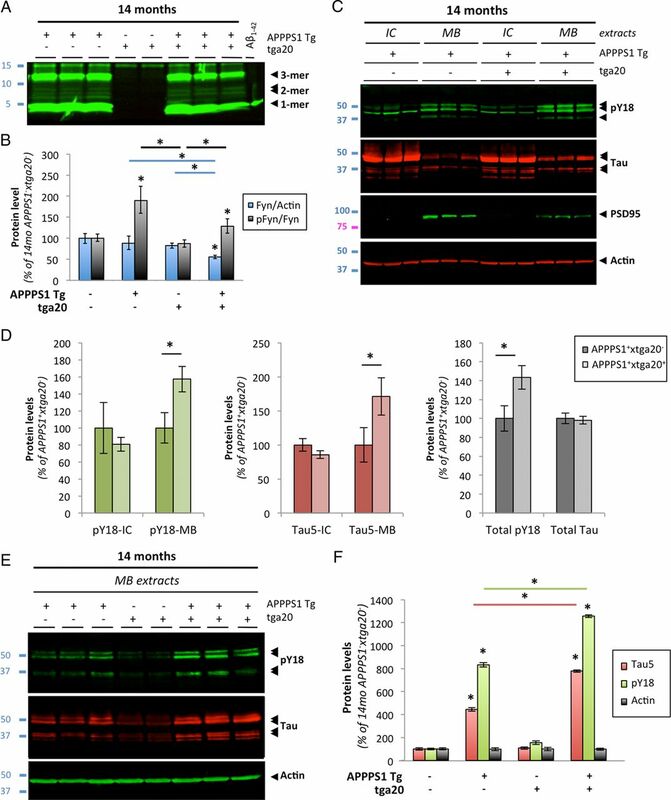 8C, lanes 3 and 4), both hyperphosphorylation at Y18 and tau mislocalization were reduced by 2.18- and 2.19-fold compared with APPPS1+×Prnp+/− littermates (Fig. 8C,D). 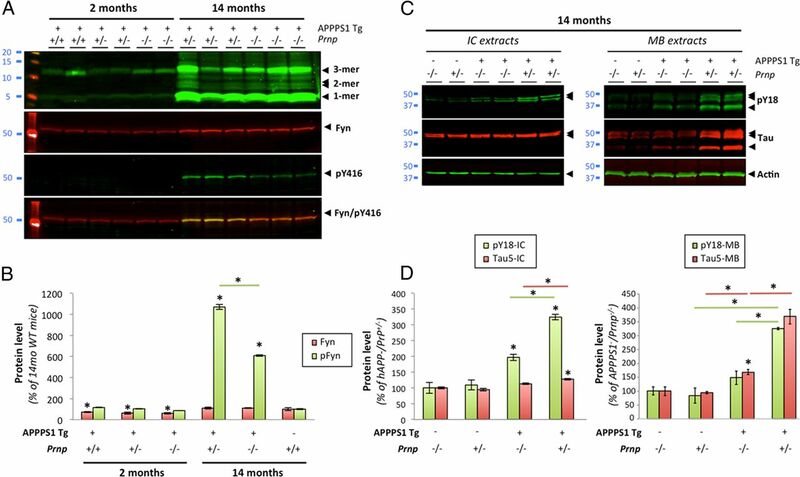 These data thus indicate that lowering Prnp gene expression reduces the activation of Fyn and hyperphosphorylation of tau at Y18 induced by Aβ/APP molecules in aged APPPS1+ mice. To provide further evidence that PrPc is involved in mediating the effects triggered by dimeric Aβ in vivo, we crossed PrPc-overexpressing mice (thereafter called tga20+) with APPPS1+ mice. Calella et al. (2010) previously described these mice. Analogously to the absence of alterations in Aβ levels across APPPS1+×Prnp genotypes, we did not observe overt changes in low-molecular Aβ levels by quantitative Western blotting in APPPS1+ × tga20+ mice compared with age-matched APPPS1+ × tga20− animals (Fig. 9A) (data not shown). Aβ-induced activation of Fyn and tau hyperphosphorylation is enhanced in aged APPS1 mice overexpressing PrP. A, Soluble brain levels of low-molecular-weight Aβ oligomers in 14-month-old APPPS1×tga20 mice was assessed by quantitative Western blot (WB) using 6E10. B, Quantification of total Fyn, pY416-Src, and actin protein levels in 14-month-old mice (APPPS1−×tga20−, APPPS1+×tga20−, APPPS1−×tga20+, and APPPS1+×tga20+) following WB. A marked elevation of pY416-Fyn was observed in APPPS1+×tga20+ compared with APPPS1−×tga20+ mice. C, Tau missorting was illustrated by biochemical segregation of pY18-Tau, total tau, PSD95 in IC versus MB extracts using Western blotting. D, Quantification of PY18-tau and total tau immunoreactivity across protein fractions and genotypes. Aged APPPS1+×tga20+ mice showed a ∼1.8-fold accumulation of tau and a ∼1.6-fold increase in phosphorylation at Y18 compared with age-matched APPPS1+×tga20− mice. 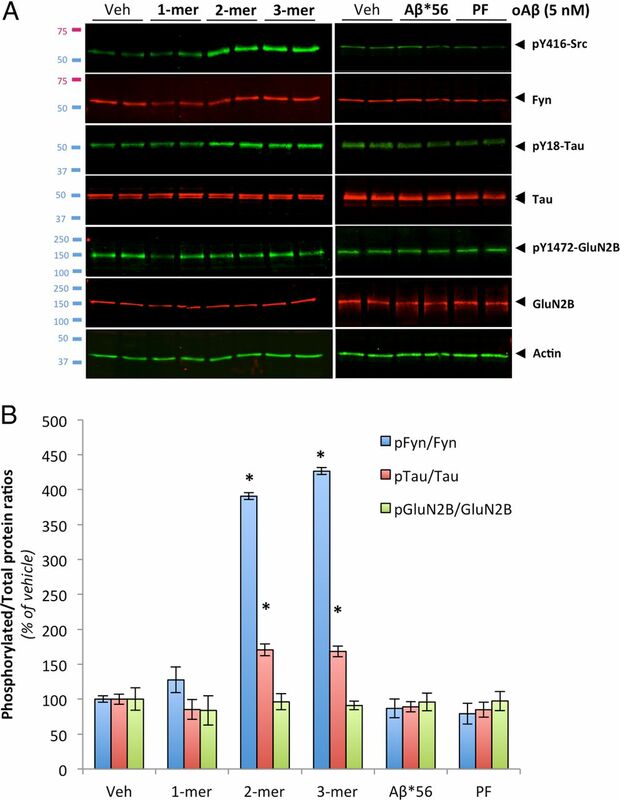 E, Enhanced accumulation of full-length tau and cleavage products phosphorylated at Y18 in PSD95-containing extracts of old APPPS1+×tga20+ mice. Actin was used as internal standard. F, Quantification of tau species immunoreactive for Tau5 and PY18 in 14-month-old APPPS1−×tga20−, APPPS1+×tga20−, APPPS1−×tga20+, and APPPS1+×tga20+ mice (bars represent the mean ± SD; *p < 0.05, ANOVA followed by Student's t test; n ≥ 3 animals/genotype/age/experiment). We then measured total Fyn, pY416-Fyn, and actin brain levels by quantitative Western blotting (data not shown). Following image analyses, the pFyn/Fyn ratio was elevated in old APPPS1+ × tga20+ mice compared with APPPS1− × tga20+ (Fig. 9B). There was no statistical difference between APPPS1+ × tga20− and APPPS1+ × tga20+ animals at 14 months of age. Importantly, an abnormal elevation of the pFyn/Fyn ratio in aged APPPS1+×tga20+ mice was observed despite a ∼33% reduction of total Fyn in these mice (Fig. 9B). Since exogenous application of AD brain-purified Aβ oligomers induced tau missorting and hyperphosphorylation at Y18 in primary cortical neurons, we determined whether similar tau changes were found in vivo and whether PrPc overexpression led to a potentiation of these pathological alterations already present in APP transgenic mice (Ittner et al., 2010). As described previously (Lesné et al., 2006; Larson et al., 2012) and earlier in this manuscript (Fig. 7), MB extracts selectively contain postsynaptic density proteins as illustrated in Figure 9C by the presence of PSD95 in MB but not in IC fractions. Comparing the biochemical distribution of pY18-tau and total tau (reflected by Tau5 immunoreactivity) in IC/MB brain lysates from APPPS1+×tga20− or APPPS1+×tga20+ mice (Fig. 9C), it was readily visible that pY18-tau levels were elevated in MB extracts of APPPS1+×tga20+ mice while intracellular pY18 levels remained equivalent (Fig. 9D). Soluble total tau levels across IC and MB fractions also displayed a similar profile (Fig. 9C,D). Of interest, despite possible changes in the respective amounts of full-length and cleaved tau products, the overall levels of total tau were comparable between APPPS1 transgenic mice (Fig. 9D, right panel). 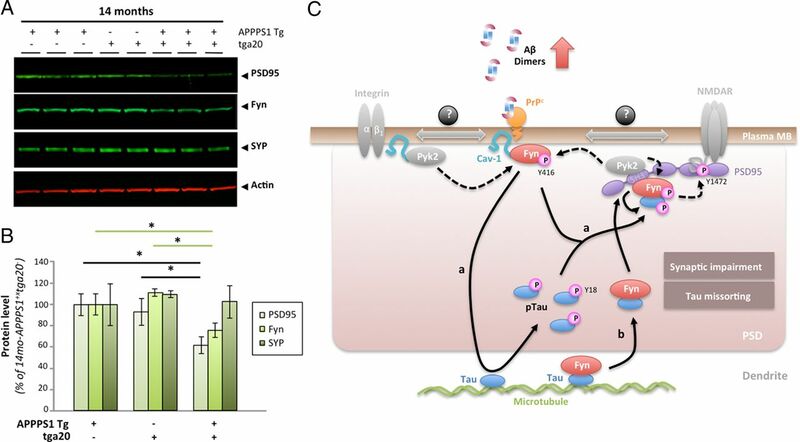 When focusing on tau molecules present in the PSD95-containing protein fraction, we confirmed a potentiation of phosphorylation at Y18 for tau species of ∼50–52 and ∼35 kDa in APPPS1+×tga20+ compared with APPPS1+×tga20− mice (Fig. 9E,F). In contrast, very little tau immunoreactivity was detected in APPPS1−×tga20+ littermates (Fig. 9E, lanes 4 and 5). Total actin levels remained unchanged across all genotypes tested (Fig. 9E,F). Intrigued by the apparent reduced expression of total Fyn in aged APPPS1+×tga20+ mice, we postulated that the reduction of this postsynaptic protein might simply reflect a potentiation of the synaptotoxic effects of Aβ dimers previously reported (Shankar et al., 2008; Jin et al., 2011). To test this hypothesis, we measured two additional well known presynaptic and postsynaptic proteins, synaptophysin and PSD95 alongside Fyn in our 14-month-old groups (Fig. 10A). Quantification of the data revealed a selective decrease in postsynaptic proteins in APPPS1+ × tga20+ mice compared with APPPS1+ × tga20− and APPPS1− × tga20+ animals (Fig. 10B), suggesting that PrPc overexpression in aged APPPS1 mice may potentiate Aβ dimer-induced synaptotoxicity. PrPc overexpression in aged APPPS1 mice triggers a selective decrease in postsynaptic proteins. A, Apparent selective decrease in postsynaptic proteins PSD95 and Fyn in 14-month-old APPPS1+×tga20+ mice. Representative WBs for the postsynaptic proteins PSD95 and Fyn as well as for the presynaptic vesicle protein synaptophysin (SYP) are shown. Actin was used as internal standard. B, Quantification of PSD95, Fyn, and Synaptophysin in 14-month-old APPPS1+×tga20−, APPPS1−×tga20+, and APPPS1+×tga20+ mice revealed significant reductions in postsynaptic proteins in APPPS1 mice overexpressing PrPc (bars represent the mean ± SD; *p < 0.05, ANOVA followed by Student's t test; n ≥ 3 animals/genotype/age/experiment). C, Proposed model of tau regulation by the triad oAβ-PrPc-Fyn. In the presence of accumulating Aβ dimers, PrPc, Fyn, and Cav-1 form a complex at the plasma membrane (likely with receptors such GluN or integrins known to interact with Cav-1 and Fyn). Upon phosphorylation of Fyn at Y416 (possibly by the kinase Pyk2), this complex becomes biologically active. Two scenarios are possible depending on the status of Fyn with respect to tau: Fyn is not bound to tau (a), and Fyn is bound to tau (b). In a, activated Fyn causes the hyperphosphorylation of tau at Y18 and its aberrant accumulation at the postsynaptic density (PSD). It is possible that pFyn might be bound to pTau at this stage and binds the SH3 domain of PSD95, where it is ideally located to modulate GluN/NMDA receptor subunits (i.e., GluN2B at Y1472). In model b, Fyn is already bound to tau in the dendrite, translocate to the PSD to interact with PSD95. There, Pyk2 could phosphorylate Fyn at Y416, resulting in Fyn activation and tau phosphorylation at Y18. Together, our genetic data provide further evidence for a cellular signaling pathway linking soluble Aβ, PrPc, Fyn, and tau in AD pathogenesis. The Src kinase Fyn has been proposed to mediate oligomeric Aβ neurotoxicity since Klein and coworkers (Lambert et al., 1998) first reported that synthetic globular Aβ species (or ADDLs) required the expression of Fyn to be deleterious to cells. Following this initial report, several in vivo lines of evidence demonstrated that Aβ, Fyn, and tau might constitute a deleterious triad in AD physiopathology (Chin et al., 2004, 2005; Ittner et al., 2010; Zempel et al., 2010; Roberson et al., 2011). With the recent discoveries that the cellular form of PrP can act as a surface binding partner for large synthetic Aβ oligomers (Laurén et al., 2009), that PrPc is required for memory impairment in APP transgenic mice (Gimbel et al., 2010), and that PrPc can form a complex with Fyn (Mouillet-Richard et al., 2000; Um et al., 2012), these accumulating observations point out Fyn as a crucial mediator of synaptotoxicity triggered by soluble Aβ molecules. The controversy surrounding the potential interaction between PrPc and Aβ molecules ([No authors listed], 2011) may result from the source, state of aggregation, and manipulation of Aβ oligomers. Strittmatter and coworkers (Gimbel et al., 2010) previously established the potential functional relevance of PrPc in Alzheimer's disease using APPPS1×PrPnull mice (APPswe/PS1ΔE9 line). Gimbel and coworkers showed that synaptotoxicity and behavior was rescued by Prnp deletion, thereby demonstrating the functional relevance of PrPc in mediating Aβ/APP-induced deficits. This particular point was recently further validated by using electroencephalogram recordings (Um et al., 2012). The crucial questions that needed to be addressed by the field were to determine the following: (1) What endogenous soluble form of Aβ is binding to PrPc? (2) What signaling pathway is activated upon complex formation (if complex there is)? (3) Is PrPc coupling oAβ and tau pathology? (4) Why did some groups observe a mediation of oAβ toxicity by PrPc and why did others not? In this study, we deliberately chose to use Aβ oligomers endogenously produced or secreted in human brain tissue or in primary neurons. Since we do not possess oligomer-specific tools to visualize each putative soluble Aβ form in situ at the present time, we define soluble endogenous Aβ oligomers as Aβ molecules that (1) remain soluble in aqueous buffers following ultracentrifugation, (2) are SDS resistant following tissue lysis, (3) are affinity purified, (4) are separated in liquid phase chromatography, and (5) are immunoreactive to at least two different Aβ antibodies. For these reasons, the terms “Aβ dimer” and “Aβ trimer” are used here to describe species that migrate as apparent dimer/trimer on SDS-PAGE even though it is conceivable that these species may not necessarily exist or function as dimers/trimers in vivo (O'Nuallain et al., 2010). All preparations used in our experimental paradigms are biochemically characterized and documented (Fig. 4). Under these conditions, we report that Fyn expression and Fyn activation are correlated with PrPc levels in AD brain. The elevation of PrPc observed in our AD cohort is further supported by recent studies indicating that PrPc accumulates in dystrophic neurites in AD (Takahashi et al., 2011) and that PrPc expression at the cell surface is increased by synthetic Aβ oligomers (Caetano et al., 2011). We also show that endogenous soluble Aβ species, specifically dimers, interact with PrPc and Fyn in vivo and ex vivo combining biochemical approaches and confocal imaging. These findings were supported by colocalization studies performed in Tg2576 primary cortical neurons used as a model of chronic exposure with endogenously produced Aβ oligomers. In parallel, we applied affinity-purified Aβ oligomers from TBS extracts of AD brain tissue to nontransgenic primary cortical neurons as a model of acute exposure. Again, under these parameters, exogenous human Aβ oligomers colocalized with PrPc and Fyn in certain dendritic spines. Moreover, we demonstrated that pretreatment or treatment with 6D11 prevented oAβ-induced activation of Fyn. Finally, we showed that Prnp gene dosage regulates Aβ-induced phosphorylation of Fyn and tau in vivo at ages when dimers are present. Together, these results support the earlier report that PrPc acts as a receptor for oligomeric Aβ and links oAβ to disease-relevant tau changes. In contrast to previous studies however (Laurén et al., 2009; Balducci et al., 2010; Barry et al., 2011; Freir et al., 2011; Um et al., 2012), we directly show that AD brain-purified Aβ dimers are specifically binding to PrPc, activate Fyn, which in turn triggers tau aberrant missorting and hyperphosphorylation. Our results are in contrast with recent findings indicating that insoluble monomeric Aβ is interacting with insoluble PrPc conformers, called iPrP, in the detergent-insoluble protein fraction of AD brain tissue (Zou et al., 2011). Using five antibodies raised against PrPc (8B4, C20, 6D11, M20, and 7D11) and four antibodies against Aβ (6E10, 4G8, and 40/42-end specific Mab2.1.3 and Mab13.1.1), we did not detect Aβ monomers coimmunoprecipitating with PrPc (data not shown) (Fig. 2). Given the aggregation propensities of Aβ and PrP, it is conceivable that detergent-insoluble fibrillar forms of both proteins might interact with each other. This notion is supported by previous reports indicating that PrPc accumulates in amyloid deposits (Ferrer et al., 2001) and Aβ codepositing with PrPSc aggregates in Creutzfeldt–Jakob disease (Debatin et al., 2008). In human studies, apparent endogenous Aβ dimers were only found in brains of subjects with AD (Shankar et al., 2008; Mc Donald et al., 2010) when comparing individuals with extensive amyloid and tau pathology and subjects with no detectable amyloid accumulation. In animal models of AD such as Tg2576 (Kawarabayashi et al., 2004) and J20 (Meilandt et al., 2009; Shankar et al., 2009), Aβ dimers can be detected at 10–12 and 10–14 months of age, respectively. Interestingly, these ages correspond to amyloid plaques depositing in cortical areas (Mucke et al., 2000; Kawarabayashi et al., 2001). Together, these findings suggest that Aβ dimers are closely associated with fibrillar Aβ. Moreover, Aβ dimers can be extracted from insoluble Aβ deposits (Shankar et al., 2008; Mc Donald et al., 2010), further suggesting that amyloid burden and brain levels of Aβ dimers might be related. Our findings and the point mentioned above could explain the lack of PrP dependence in Aβ-induced LTP impairment seen in young, 2- to 4-month-old APPPS1 mice (Calella et al., 2010) and 4- to 7-month-old J20 mice (Cissé et al., 2011b), which only display fair amyloid deposition at the age tested (Mucke et al., 2000; Radde et al., 2006). Our own studies in 2-month-old APPPS1 mice seem to confirm this notion as we demonstrated that Aβ dimers were beyond the sensitivity of our detection assay currently limited to <5 pg of human Aβ (Fig. 8A), that Fyn was not activated at that age, therefore suggesting that the PrPc:Fyn complex is not engaged. Based on our findings, we also speculate that ≥14-month-old APPPS1+×Prnp−/− mice would display a significant LTP rescue compared with age-matched APPPS1+ mice. In agreement with our results, both synaptotoxicity and cognitive deficits were rescued in aged 12-month-old APP transgenic mice with abundant deposited amyloid (APPswe/PS1ΔE9 mice) lacking PrPc compared with APPswe/PS1ΔE9 littermates (Gimbel et al., 2010). We therefore predict that the spatial reference memory deficit characterizing J20 mice would also be rescued (in part) by the ablation of the Prnp gene in old J20 animals, when Aβ dimers are readily detected (10–14 months of age). By extension, the mediation of endogenous oligomeric Aβ-induced LTP/cognitive dysfunction by PrPc would greatly depend on age and plaque-associated dimeric Aβ levels. Finally, while SDS-stable Aβ dimers or forms composed of Aβ dimers appear to interact with PrPc/Fyn, it is also possible that higher-molecular-weight assemblies of Aβ existing in the absence of denaturing agents may also interact with this pathway. Several other receptors for Aβ oligomers have been proposed including mGluR5 (Renner et al., 2010), NMDA receptors (Decker et al., 2010), and EphB2 (Cissé et al., 2011a). However, none of these studies showed that specific, soluble, endogenously produced Aβ assemblies interacted with these receptors by combining coimmunoprecipications and imaging techniques using AD or APP transgenic brain tissue. Importantly, we used medically relevant specimens to purify soluble Aβ oligomers to apply nanomolar concentrations of these proteins for in vitro and ex vivo paradigms. Of notable interest, picomolar concentrations of the same Aβ assemblies did not trigger Fyn activation (data not shown). In addition, the identification of PrPc as a molecular link between Aβ oligomers and Fyn may reveal new potential strategies to slow down the progression of AD. Contrary to Fyn, PrPc is a membrane-anchored protein, thus relatively accessible. Several PrP antibodies binding to the 95–105 domain of the protein have been shown to block Aβ binding (Laurén et al., 2009; Barry et al., 2011; Freir et al., 2011). Among them, the antibody 6D11 was recently used as a novel treatment for cognitive deficits in APP transgenic mice (Chung et al., 2010). We further extended these findings by reporting here that 6D11 also inhibits Fyn activation induced by acute and chronic exposure to human Aβ oligomers in primary neurons. Even though the activation status of Fyn in APPPS1 mice used by Chung and coworkers is unknown, we would expect pY416-Fyn to be downregulated in 6D11-treated animals based on our findings. Last, we demonstrated that PrPc-dependent activation of Fyn induced by Aβ dimers leads to tau missorting and tau hyperphosphorylation at tyrosine 18 both in vitro and in vivo. PY18-tau is found in neurofibrillary tangles in AD brain (Lee, 2005) and tangle-forming tau transgenic brains (Bhaskar et al., 2005, 2010). Until now, however, a direct link between this hyperphosphorylated tau species and oligomeric Aβ was only speculative or fragmented. Despite the demonstration that tau and Fyn are mediating Aβ-induced toxicity in experimental mouse models (Roberson et al., 2007, 2011), the status of Y18 phosphorylation had not been investigated in these studies. Our work characterized a signaling pathway coupling endogenous oAβ, Fyn, and tau, thereby providing a mechanistic link for the studies by Mucke and coworkers. In addition, we showed that tau localization to dendritic spines is exacerbated in the presence of oAβ in a PrPc:Fyn-dependent fashion in vitro and in vivo, thereby further documenting the importance of the dendritic positioning of tau (Hoover et al., 2010; Ittner et al., 2010; Zempel et al., 2010). To summarize, we believe that the findings presented here are the first to describe a signaling cascade induced by a specific, endogenous Aβ oligomer. Importantly, this study is directly relevant to the disease process as we used endogenous Aβ oligomers from AD brain. Finally, we think this is the first description of a complete signaling pathway, including ligand/receptor/messenger/target, linking apparent Aβ dimers to tau hyperphosphorylation. Overall, our data suggest that PrPc-mediated Fyn activation might play a determinant role in late stages of AD, when Aβ dimers levels are at their highest in the brain. This work was supported in part by NIH Grants P30AG10161 and R01AG15819 (D.A.B.) and start-up funds from the University of Minnesota Medical Foundation (S.E.L.). M.N. was partially supported by an investigator fellowship from Collegio Ghislieri (Pavia, Italy). We thank Gloria Lee for the PY18 antibody, Michael K. Lee for critical discussions, Harry Orr for comments on this manuscript, and Kenji Kanamura and Hoa Nguyen for technical help. We are indebted to the participants in the Religious Orders Study. (2011) State of aggregation. Nat Neurosci 14:399, [No authors listed]. (2010) Synthetic amyloid-β oligomers impair long-term memory independently of cellular prion protein. Proc Natl Acad Sci U S A 107:2295–2300. (2011) Alzheimer's disease brain-derived amyloid-β-mediated inhibition of LTP in vivo is prevented by immunotargeting cellular prion protein. J Neurosci 31:7259–7263. (2010) Prion protein in Alzheimer's pathogenesis: a hot and controversial issue. EMBO Mol Med 2:289–290. (2002) Natural history of mild cognitive impairment in older persons. Neurology 59:198–205. (2003) Education modifies the relation of AD pathology to level of cognitive function in older persons. Neurology 60:1909–1915. (2005) Mild cognitive impairment is related to Alzheimer disease pathology and cerebral infarctions. Neurology 64:834–841. (2006) Decision rules guiding the clinical diagnosis of Alzheimer's disease in two community-based cohort studies compared to standard practice in a clinic-based cohort study. Neuroepidemiology 27:169–176. (2012) Overview and findings from the Religious Orders Study. Curr Alzheimer Res 9:628–645. (2005) Disease-related modifications in tau affect the interaction between Fyn and Tau. J Biol Chem 280:35119–35125. (2010) Tyrosine phosphorylation of tau accompanies disease progression in transgenic mouse models of tauopathy. Neuropathol Appl Neurobiol 36:462–477. (1991) Neuropathological stageing of Alzheimer-related changes. Acta Neuropathol 82:239–259. (1992) Normal development and behaviour of mice lacking the neuronal cell-surface PrP protein. Nature 356:577–582. (2011) Amyloid-beta oligomers increase the localization of prion protein at the cell surface. J Neurochem 117:538–553. (2010) Prion protein and Abeta-related synaptic toxicity impairment. EMBO Mol Med 2:306–314. (2004) Fyn kinase modulates synaptotoxicity, but not aberrant sprouting, in human amyloid precursor protein transgenic mice. J Neurosci 24:4692–4697. (2005) Fyn kinase induces synaptic and cognitive impairments in a transgenic mouse model of Alzheimer's disease. J Neurosci 25:9694–9703. (2010) Anti-PrPC monoclonal antibody infusion as a novel treatment for cognitive deficits in an Alzheimer's disease model mouse. BMC Neurosci 11:130. (2011a) Reversing EphB2 depletion rescues cognitive functions in Alzheimer model. Nature 469:47–52. (2011b) Ablation of cellular prion protein does not ameliorate abnormal neural network activity or cognitive dysfunction in the J20 line of human amyloid precursor protein transgenic mice. J Neurosci 31:10427–10431. (2008) Association between deposition of beta-amyloid and pathological prion protein in sporadic Creutzfeldt-Jakob disease. Neurodegener Dis 5:347–354. (2010) Amyloid-beta peptide oligomers disrupt axonal transport through an NMDA receptor-dependent mechanism that is mediated by glycogen synthase kinase 3beta in primary cultured hippocampal neurons. J Neurosci 30:9166–9171. (2001) Prion protein expression in senile plaques in Alzheimer's disease. Acta Neuropathol 101:49–56. (1996) Prion protein (PrP) with amino-proximal deletions restoring susceptibility of PrP knockout mice to scrapie. EMBO J 15:1255–1264. (2011) Interaction between prion protein and toxic amyloid beta assemblies can be therapeutically targeted at multiple sites. Nat Commun 2:336. (2010) Memory impairment in transgenic Alzheimer mice requires cellular prion protein. J Neurosci 30:6367–6374. (2010) Fyn-tau-amyloid: a toxic triad. Cell 142:356–358. (2010) Tau mislocalization to dendritic spines mediates synaptic dysfunction independently of neurodegeneration. Neuron 68:1067–1081. (1996) Correlative memory deficits, Abeta elevation, and amyloid plaques in transgenic mice. Science 274:99–102. (2010) Dendritic function of tau mediates amyloid-beta toxicity in Alzheimer's disease mouse models. Cell 142:387–397. 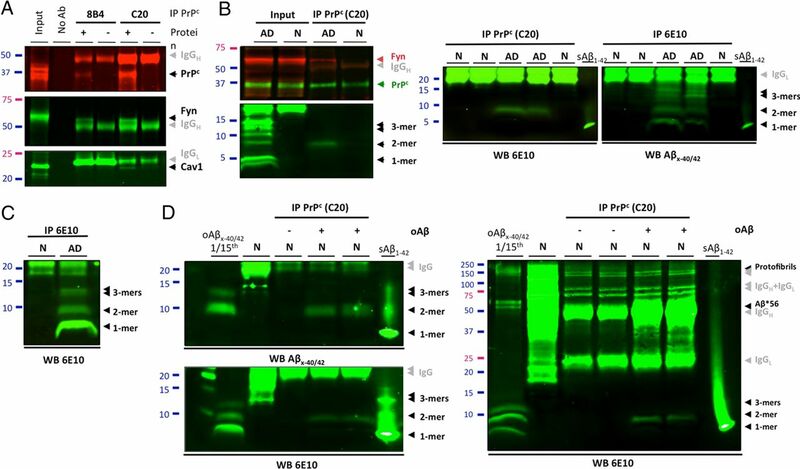 (2011) Soluble amyloid beta-protein dimers isolated from Alzheimer cortex directly induce Tau hyperphosphorylation and neuritic degeneration. Proc Natl Acad Sci U S A 108:5819–5824. (2001) Age-dependent changes in brain, CSF, and plasma amyloid (β) protein in the Tg2576 transgenic mouse model of Alzheimer's disease. J Neurosci 21:372–381. (2004) Dimeric amyloid beta protein rapidly accumulates in lipid rafts followed by apolipoprotein E and phosphorylated tau accumulation in the Tg2576 mouse model of Alzheimer's disease. J Neurosci 24:3801–3809. (2010) The prion protein as a receptor for amyloid-beta. Nature 466:E3–E4, discussion E4–E5. (1998) Diffusible, nonfibrillar ligands derived from Abeta1–42 are potent central nervous system neurotoxins. Proc Natl Acad Sci U S A 95:6448–6453. (2012) Soluble α-synuclein is a novel modulator of Alzheimer's disease pathophysiology. J Neurosci 32:10253–10266. (2009) Cellular prion protein mediates impairment of synaptic plasticity by amyloid-beta oligomers. Nature 457:1128–1132. (2005) Tau and src family tyrosine kinases. Biochim Biophys Acta 1739:323–330. (1998) Tau interacts with src-family non-receptor tyrosine kinases. J Cell Sci 111:3167–3177. (2005) NMDA receptor activation inhibits α-secretase and promotes neuronal amyloid-β production. J Neurosci 25:9367–9377. (2006) A specific amyloid-beta protein assembly in the brain impairs memory. Nature 440:352–357. (2010) The presence of sodium dodecyl sulphate-stable Abeta dimers is strongly associated with Alzheimer-type dementia. Brain 133:1328–1341. (2009) Neprilysin overexpression inhibits plaque formation but fails to reduce pathogenic Abeta oligomers and associated cognitive deficits in human amyloid precursor protein transgenic mice. J Neurosci 29:1977–1986. (2000) Signal transduction through prion protein. Science 289:1925–1928. (2000) High-level neuronal expression of abeta 1–42 in wild-type human amyloid protein precursor transgenic mice: synaptotoxicity without plaque formation. J Neurosci 20:4050–4058. (2010) Amyloid beta-protein dimers rapidly form stable synaptotoxic protofibrils. J Neurosci 30:14411–14419. (2006) Abeta42-driven cerebral amyloidosis in transgenic mice reveals early and robust pathology. EMBO Rep 7:940–946. (2010) Deleterious effects of amyloid beta oligomers acting as an extracellular scaffold for mGluR5. Neuron 66:739–754. (2007) Reducing endogenous tau ameliorates amyloid beta-induced deficits in an Alzheimer's disease mouse model. Science 316:750–754. (2011) Amyloid-beta/Fyn-induced synaptic, network, and cognitive impairments depend on tau levels in multiple mouse models of Alzheimer's disease. J Neurosci 31:700–711. (2009) The neuropathology of probable Alzheimer disease and mild cognitive impairment. Ann Neurol 66:200–208. (1999) Reduction of lipofuscin-like autofluorescence in fluorescently labeled tissue. J Histochem Cytochem 47:719–730. (2008) Amyloid-beta protein dimers isolated directly from Alzheimer's brains impair synaptic plasticity and memory. Nat Med 14:837–842. (2009) Biochemical and immunohistochemical analysis of an Alzheimer's disease mouse model reveals the presence of multiple cerebral Abeta assembly forms throughout life. Neurobiol Dis 36:293–302. (2011) Detecting abeta*56 oligomers in brain tissues. Methods Mol Biol 670:45–56. (2011) Accumulation of cellular prion protein within dystrophic neurites of amyloid plaques in the Alzheimer's disease brain. Neuropathology 31:208–214. (2012) Alzheimer amyloid-beta oligomer bound to postsynaptic prion protein activates Fyn to impair neurons. Nat Neurosci 15:1227–1235. (2002) Naturally secreted oligomers of amyloid beta protein potently inhibit hippocampal long-term potentiation in vivo. Nature 416:535–539. (2002) Rapid tyrosine phosphorylation of neuronal proteins including tau and focal adhesion kinase in response to amyloid-beta peptide exposure: involvement of Src family protein kinases. J Neurosci 22:10–20. (2008) Membrane-bound beta-amyloid oligomers are recruited into lipid rafts by a fyn-dependent mechanism. FASEB J 22:1552–1559. (2010) Abeta oligomers cause localized Ca2+ elevation, missorting of endogenous Tau into dendrites, Tau phosphorylation, and destruction of microtubules and spines. J Neurosci 30:11938–11950. (2011) Amyloid-beta42 interacts mainly with insoluble prion protein in the Alzheimer brain. J Biol Chem 286:15095–15105.